If browsing raunchy content while picking up a cold beverage is your kind of thing, you’ll be excited to know there’s now a smart fridge that features Pornhub videos on its display – or so it seems. 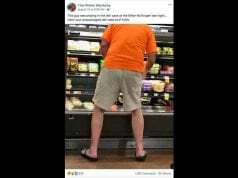 Last Sunday, antivirus maverick John McAfee was shocked to stumble upon a picture of the cheeky piece of tech at one of Home Depot’s stores and was quick to share his discovery with the Twitterverse. The picture initially appeared on Reddit a few days before McAfee tweeted, but it has since been circulating all over the Web. As people have already pointed out on Twitter, it’s not entirely clear whether the Pornhub integration is a prank, a bug or a feature – but I don’t mind it either way. One thing is for sure though: This wacky invention is bound to be Home Depot’s new bestseller. 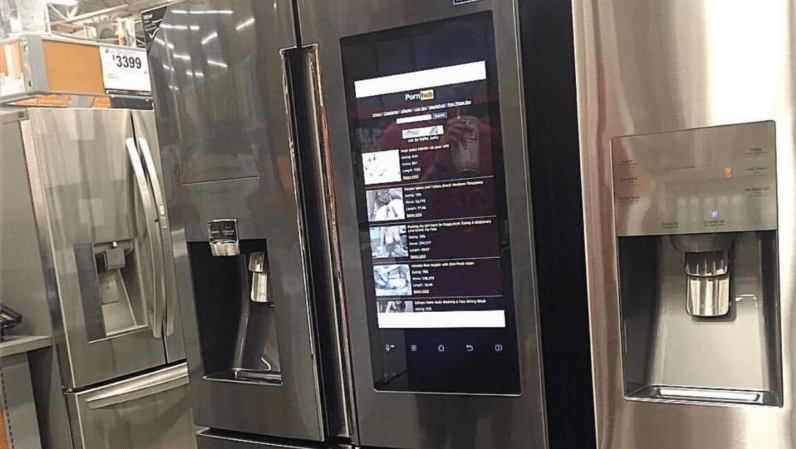 Because no household can ever feel complete without your own Pornhub-powered smart refrigerator to brighten up the atmosphere of your kitchen. Unfortunately, there’s no information on the device’s price and availability, but if I were you, I wouldn’t sit idle: I’d be rushing to the nearest Home Depot store to purchase one of these right now.